Trying To Make My Dream Reality. Cyclist riding for Memil Pro Cycling. Supported by The Lewis Balyckyi Trust Fund in 2016 and 2017, thier link is below. Follow me on: Twitter - @ben_h95 and Instergram - ben.h95. After Qinghai Lake I decided to take an easy few weeks with no structured training as my season doesn't end till December. A few days after getting home it was my birthday so I had a few nights out having fun getting drunk and living a normal life which was well needed. 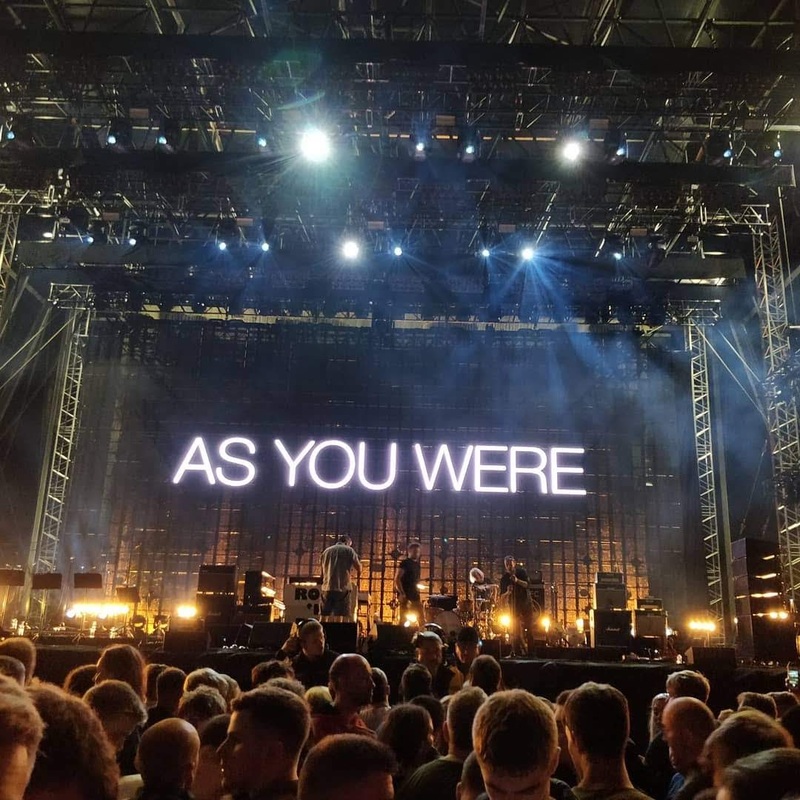 Still feeling tired after a week I took it easy on the bike before another weekend off due to going to see Liam Gallagher in Manchester. Now that was and awesome weekend, the gig was outrageous such a good experience.We managed to get right to the front of the massive 50k crowd which was surreal. After that I started training consistently again with a 210km day out to York with the lads which was a good laugh. Another 10 days of riding happened in some fairly grim weather with a number of days been wet. I also did the local club 10 mile time trial which was the last on of the year, I managed to clock a time of 18.49 which is my 3rd best time ever and only 3 seconds off my personal best on that course. Now it is time to go back to China for nearly 4 weeks. I will be racing The Xingtai Grand Valley Cup Tour of Xingtai UCI 2.2 and The 9th Tour of Poyang Lake. This block will tick off 14 more race days for the year and leave me with 25 more days to do by mid December. Bit of a short one this month but a busy next 3 months to come! This is the highest altitude race in the world so a bit of acclimatization was required before hand. The team seen us there 12 days before the race started to get use to the altitude and get some riding in to see how our bodies get on. Where we were staying was just under 2500m and there were rides close by that took us up to 3500m. I personally thought the altitude would affect me more than it was, I was breathing slightly deeper than usual but that was it. In the 12 days leading up to the race we managed to acclimatize, train and then tapper so it was a perfect amount of time pre race. The race will be the longest I have ever done as well as the highest UCI level I've raced at. It is 13 stages with 1 rest day after 9 stages and it covers nearly 1900km. The shortest stage been only 66km but that's also a mountain top finish day topping out at 4120m, then the longest stage 237km. Stage One 161km. Everyone knew it was going to be a sprint and 3 guys just floated off in the first kilometer then we ended up first team and just decided to take on the role of controlling the pace. The team did a great job at it. I ended up doing about 70% of the stage on the front making sure our sprinter and GC guys had it easy while Sam could look after Tipper for the sprint and Rob on bottles that day. I eventually came of the front with around 8km to go after a rapid chance and then time keeping the pace as high as possible with Minsk to stop late attacks going. Unfortunately Tipper had bad luck and bad legs for the sprint and didn't place anywhere. Still the team showed from the stage that we were there to race our own race. 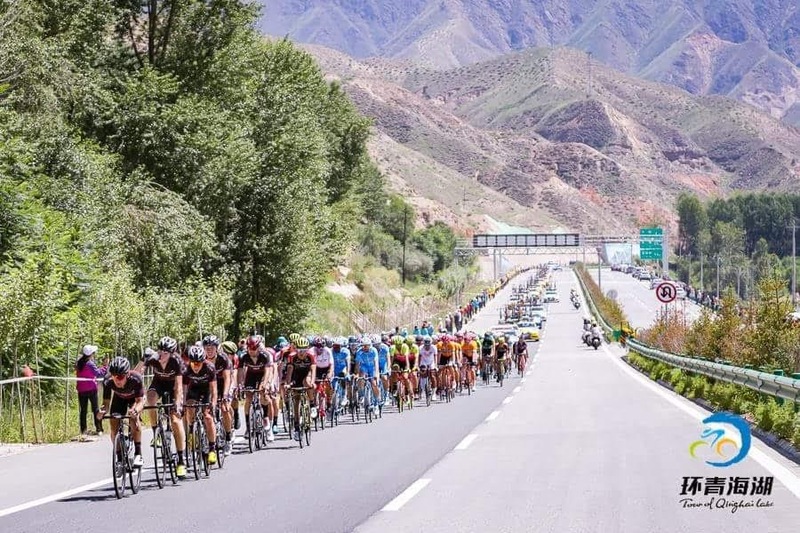 Stage Two 114km in wet conditions around the city of Xining. Again an early break of 3 got away on the first lap. The team didn't want to chase and the yellow jersey team didn't want to either so after a while Sam told me to attack cause a chase and it work we halved the gap in half a lap and then teams got more organised and other teams came to the front to work and control thing. It ended in a bunch sprint where Tipper was unlucky again. Stage Three 133km with a HC cat climb in the middle of the stage. The team plan was for Sam or I to get in the break. Sam managed to get in a move but it was only him and one other so it ended up been a hard day out for him getting caught with 3km of the climb to go. I got distanced on the climb but managed to get back into the front group where our 2 GC guys were. I managed to get 23rd on the stage but It was still a group of around 80 riders. Stage Four 100km which will help sort the GC out massively with a 30km climb then decent then a 3rd cat climb before a 10km descent to the finish. I tried for the early break but that was a fail as the climb started 20km into the stage. 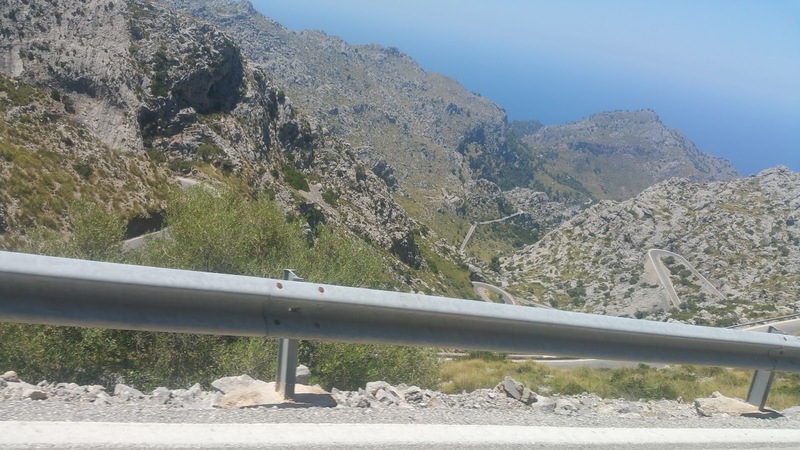 Also once on the climb I was regretting the breakaway attempts. I managed to come in 37th on the stage just over 10 minutes down on the winner and the brothers both rolled in 4 minutes down on the winner showing they are up for a good GC ride. Stage Five 235km flat and set to be a bit boring work for the sprint again was the plan. The day was a long a boring one with no action happening until 15km to go where the race split in the cross winds but all came back together. There was a crash in the final 3km which held the team up still 4 on the same time as the winner. Stage Six 66km mountain top finish topping out at 4120m. The plan was to ride at the front for our climbers. The stage ended up been 57km as they skipped a lap by mistake before the climb. The two climbers finished 12th and 15th on the stage and I finished 36th to move the team up to 5th in the team GC. Stage Severn 169km which didn't go to plan with Tipper getting dropped on the climb. So I tried going away 40km to go but got caught 15km to go with only one other rider with me. Stage Eight 237km dropping from 3500m to 1500m so it was to be a fast day and that it was averaging 49kph. We set Tipper up for the sprint he got a bit swamped and got 24th. Stage Nine 175km the last stage before the rest day thankfully. We road for Tipper all day and he delivered 11th his best result so far. and good confidence boost for him going into the rest day and the final 4 days which are all sprint days on paper. Stage Ten 123km in the dessert so it was expected to be crosswinds. We rode near the front all day to ensure if it split we would make the front group. The race didn't split but going into the final 8km there was a turn before cross head wind to the finish. We lost each other and some slipped back and only Sam held position so unfortunately Tipped didn't get the chance to sprint. Sam rolled his best result on the tour to date with 20th. Stage Eleven 111km flat ciurcut race perfect for tipper at lower altitude as well. We went for a different leadout approach for Tipper on this stage with him following only Sam through the bunch. It took time to get Tipper to make sure to follow Sam all day through gaps as practice but he started doing it well with me behind him incase he needed back up. This worked really well for him and he managed to deliver big time for us with an epic stage win. Making the team spirit so high and also giving himself massive confidence in his abilities and the teams. Stage Twelve 106km another flat day with very little action till the end. We went with the same plan as the previous stage but it wasn't to be with Tipper losing Sam's wheel and trying to move up in the wind himself he blew before the sprint opened up. Stage Thirteen 108km the final stage of the tour and it wasn't going to be a procession day with the green jersey battle on it was fast from the offset and continued all the way to the end. Sam once again was to surf the wheels in the sprint for Tipper. He once again did a fantastic job for the team but knowing Tipper was struggling he also was going for a personal result which he managed by getting 11th on the stage all down to great positioning. 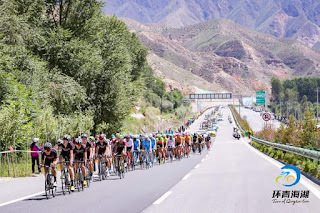 With the 17th Tour of Qinghai Lake over and the teams first ever UCI HC race. I personally think it went really well for the team and myself. We got a stage win, 5th on the team GC, 11th and 13th on the individual GC and several top 20s. Also we showed everyday we were there to race hand and not just there to make he numbers up. Returning home for a bit of down time and a few nights out for my birthday before training again before going back to China at the end of August for another race block out there. I was so tired the first week I was back and spent the majority of my time sleeping and been very unproductive with my time. With 4 weeks to go till national and in the middle of that block I have 2 UCI 1.1 races in Denmark in preparation for the nationals. My main goal is the national time trial champs and hopefully get a top 10 as a first year in the elite men’s. 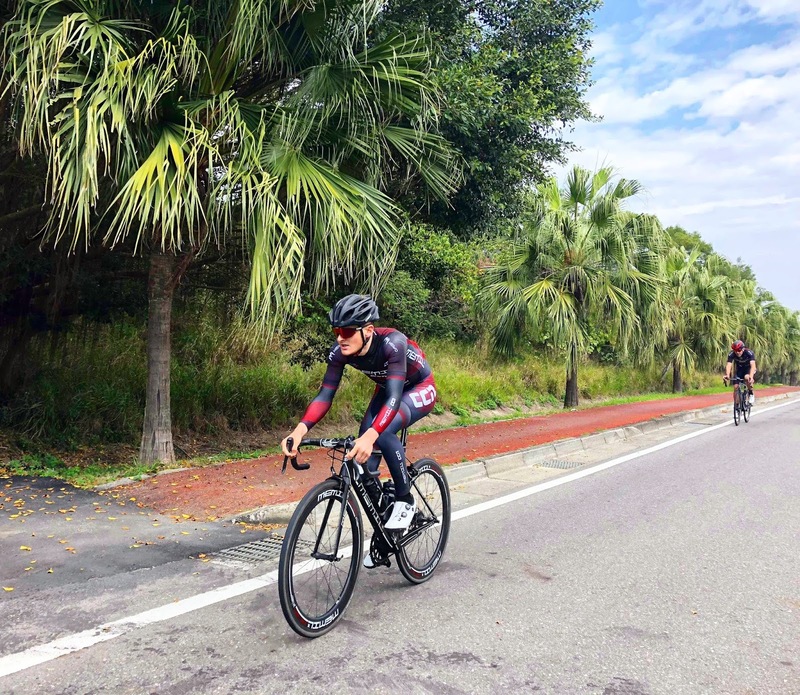 All my training is geared towards the time trail and also to carry form into July where I will be going to China to compete in the tour of qinghai lake UCI 2.HC. This race is a 13 day stage race so along with hard threshold efforts I need to get plenty of hours in the legs to get in good condition for the stage race. Denmark only 10 days before the national tt champs will set me up well with race speed. Day one I Denmark was 200km rolling and expected to be a bunch sprint. The race didn’t go to plan with both our sprinters having technical issues and there for dnf’s I tried a few late attack that came to nothing and finished just off the bunch due to a crash I was caught behind with 2km to go. Day 2 was more of a rolling day with an early break expected to go. I tried to get in there but got swamped at a critical point in the race and ended up mid bunch on the narrow lanes. After 90 the race went full gas in a cross wind section. I was too far back and rode across 2 groups but then the group I got in looked to be giving up so people started attacking it and it split to bits and that ended my race. Pierre managed to do a solid ride and finish 18th. Once I got home I was only focused on the time trial. Riding my tt bike everyday getting use to the position more. The day of the nationals was hot conditions of high 20’s and little wind. When it was time for me to set off it was still really warm and I went out hard and after a lap I thought it was unsuitable so eased off a bit the. The last lap I was all in and knew then I had took the second lap too easy. I ended up 11th 7seconds off 10th so fairly pleased at the results, but gutted at the same time due to such a bad second lap. National road race champs on the Sunday the aim was to at least finish it due to the fact I’ve never finished it before. My plan for the day was to get in the early move and the race come to me or it all get brought back and to hang in till the finish. Again the weather was really good, low winds and high temperatures. Hydration would be key to getting round. My dad and Peter Hale were in the feed zone to ensure I could get at least 2 bottles a lap. At the start of the race I started near the back but managed to get to the front after 8km or so. Once at the front I made sure I was active attacking and following moves as I wanted to get in the break. A group of 6 got away after a bit and I missed it so as soon as a gap opened I attacked across to it then the race came back together. Another move went and I followed and got in that, as that was about to be brought back I attacked solo and got a gap. As I was coming into Stamfordham for the first time 5 riders came across to me and I jumped on the back of them. They really put the pressure on up the feed climb and I had to dig so deep to stay on the wheels. I managed to hold on and work with them after we had drop one guy so it was only 5 of us riding for 15km until a group of 11 came across to form a lead group of 16. This group was well committed with everyone riding and keeping it smooth at the half way point it looked like it would be the winning group. The 3rd time up the ryals I was riding it steady like the other times and there was an attack which I wasn’t expecting as there was still 70km of racing to go. I ended up getting distanced and had to ride myself back into the break. Going into the last 25km I realised I was in the mix for the race win and was running off adrenaline I tried a long attack as I knew that was my best chance. That was brought back but then I made it into every major split after that. I attacked again about 15 km out but was brought back then Connor Swift attack I tried to follow him but was unable to get to his wheel and just hung in no mans land until a group of 4 came to me and the we worked for a bit to get Connor back but as soon as someone missed a turn everyone started looking at each other. I tried a few more attacks as I knew I was the slowest finisher in that group. I was unable to get away and ended up 6th which is way more than I expected going into the race and was super happy to pull off such a ride. I definitely surprised myself and proved to myself I can compete at that level now. 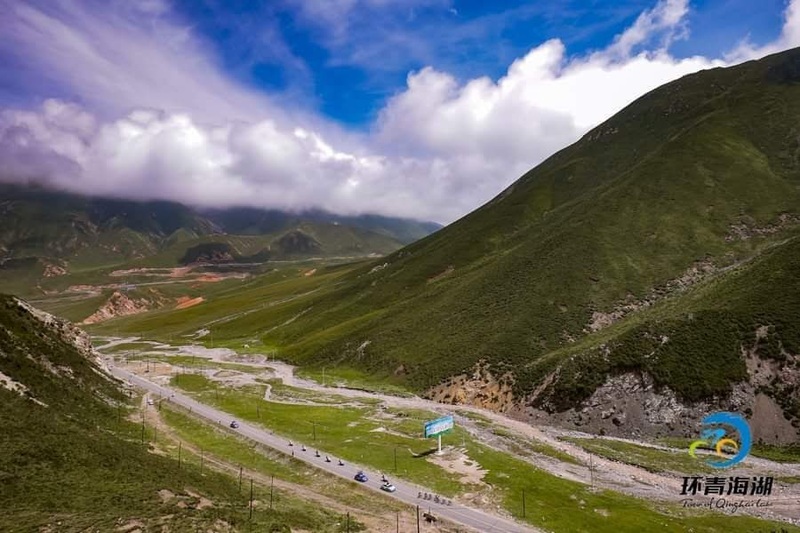 Now I need to carry the form and positive vibes into China for tour of Qinghai lake. After Rutland I took a little break from training for a week to recover from a hard start to the season and fully recover from the cold I had picked up while in Morocco. May was a perfect time to do this with only 3 UCI race days in the month and 2 of them were on the last weekend of the month. After my week off I started upping my training again and doing double days with mid week races on the evening. With 2 weeks of solid training in the legs it was time to head to Sweden for the Scandinavian Race in Uppsala UCI 1.2. The team rode to the plan and it didn't pay off, tactically we messed up and had not back up plan. So the main thing we took from this race was experience and turned the negatives into learning. Still it was good to be back racing and helping the team out. My legs felt good after the rest and training. I knew I had a good 10 day block of training between Sweden and Estonia so when I got home I continued training well and getting into better shape for Estonia. Tour of Estonia UCI 2.1 a 2 day race with the first stage 215km from Tallinn to Tartu then stage 2 a 175km 18 lap circuit around Tartu. Stage 1 the plan was to be in all the moves and aim for kom points sprint points and a result. 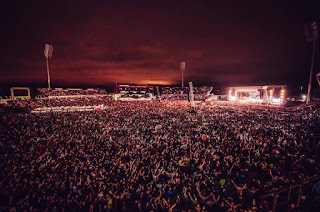 The team and myself managed to make this happen with us always active and following moves for the full stage. I managed to get away solo and take the first sprint of the day which got me 3 bonus seconds. Then the race was full gas from there with splits happening then it coming back together. The stage final ended in a bunch sprint where Tipper managed to get 10th. With the bonus seconds I picked up it meant going into stage 2 I was 5th on GC. Stage 2 didn't go to plan missing the final split that was the winning split. Earlier in the race Pierre made the first break for the team and then as that was brought back I got in the next move which was a strong one with around 16 guys. This move got a maximum of 3 mintues before finally getting brought back with 60km to go. Once it was all back together the pace was kept on to prevent other attacks going. With only one other team mate in the race by this point it was hard to sit up near the front as it was all full teams lined out and they weren't letting us in. We tried fighting to stay up there but it was mentally and physically hard so we sat back and the lap after we did that the race split and around 14 guys ended up going clear. Then 3 clipped off from my group before I got away in the final kilometers. I ended up 19th on the stage and 17th overall in the race. Very gutted not to top 10 or even top 5 after the day before but still 17th on GC at UCI .1 level isn't too bad. That sums up May. I started June with a National B road race up in Scotland as it's a bit more fun and harder racing than training on your own. The race started off very fast will many attacks. After 10km there was a break of 5 up the road. The bunch just kept attacking each other the rest of the race until 30km to go when the bunch finally split and it was 10 guys that actually wanted to race and try to get the break back. On the final climb I went into it first and started riding up it hard to keep the pace up. I looked back and I had gaped the group I was with so I pressed on and rode across to the break on my own. The break had split with one rider up the road and the 4 I had caught, 1 more rider got across later and I tried to get the group working as the chase group was between 30 seconds to a minute behind. There was 3 Ribble in the group and they had a team mate away who wasn't getting caught by the finish yet they weren't fully committed to work to hold of the chasers. We ended up holding off the chasers and I messed up the finish going into the last corner last man and the finish wasn't far out of that final corner I managed to get 4th in the race. I was a good day out with plenty of hard efforts, great training for races to come. In June I have 3 UCI 1.1's, National TT Champs and National Road Race Champs. 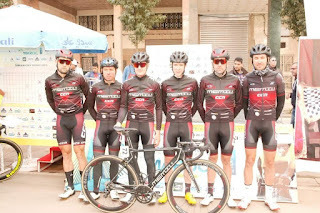 Tour Du Maroc and the rest of April. I arrived in Casablanca two days before the race started. This was plenty of time to get ready for the race and everything sorted ready for ten days of racing. The roads were limited for training on for those two days. 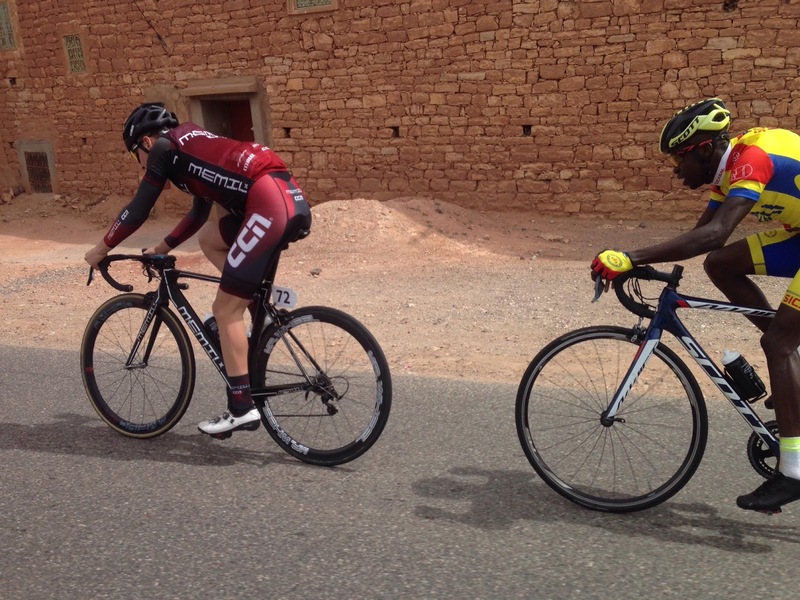 The team and I were able to do enough to riding to keep ticking over before the tour started. 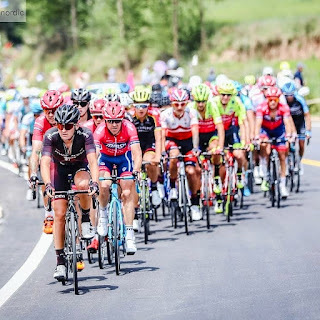 The race had a good field with the key teams being Willier Trestina and Vandee U. Willier had their Giro team there as the race is over ten days and covers close to 1600km. Stage 1, was a potential sprint day or the chance of a late break winning. Willier from the very start showed they wanted it to be a sprint only letting 3 riders in the break and controlling the pace from the early kilometers. The teams plan was to work for Tipper for the sprint, so we rode a high position all day as a team and kept Tipper out of trouble. Sure enough the day ended in a bunch sprint and Tipper was able to get 6th on the stage. Stage 2, I rode two years ago and it ended in a sprint, so the teams plan was again to ride for Tipper for the sprint. The weather was awful with very low temperatures and rain it was set to be a hard day out. In the first 40km there was a 2nd category climb. Willier once again set the tempo and allowed a small group of four riders to go early and they took up the pace setting. We rode up near the front next to them. Once on the 2nd cat climb it looked like it was going to stay together but with 2km to go till the summit attacks started and a large group formed ahead. Willier had no riders present so we stuck to the plan and stayed with Tipper thinking the group might come back after the climb as it was still 130km till the finish. Unfortunatly we were wrong and that group went on to win the stage by over 20 minutes. Stage 3 was 200km and completely flat. This was a relatively easy stage with it ending in a bunch sprint. Unfortunately our lead out got split up going around a roundabout and Tipper had to do a lot of work himself in the final kilometer and finished 12th. Stage 4 the Queen stage, 200km with three 2nd cat climbs, a 1st cat climb then a 3rd cat climb. The plan was to get in the break an hope it could have been the winning move. I managed to get in the break but it wasn't to be, the peleton only allowed the break to get a maximum of 2 minutes. I managed to hang on over the 3rd 2nd cat climb of the day after been caught just before it and then I got distanced on the 1st cat climb. I went over the climb in the 3rd group but punctured on the descent and had to wait over 5 minutes for a wheel change as the race was in bits. This meant I ended up doing the final 70km on my own, making the stage a very damaging one for my legs for a very poor result. Stage 5 Tipper said he wasn't feeling great so didn't want us to ride for him so the only option for the team was to get in the break. Sam got in an early move which came back so I followed the next attack and this turn out to be the main break for the day. Every main team was represented and it looked like it could have been the winning break. Willier must have had a plan though as their sprinter Mareczko made it over the climb of the day so their guy from the break dropped back and they chased hard. When the gap was under a minute with still 60km to go I decided to drop back to try help the team if Tipper was still in the bunch. As I got into the bunch I found out Tipper had crashed, he was alright and back on the bike but was just riding into the finish in the groupetto. Stage 6 I woke up ill with cold. The stage was fairly flat but very windy. It split early on with Sam and Tipper making the front split, Pierre and myself were in the second group which made it back on after 20km. After around 90km attacks started and we were covering them but missed a very important one. So I decided to chase it down for Tipper, Sam saw me doing so and came to help. For about 15km Sam and I worked with Baku to help bring it back. Pierre then came to help bringing the yellow jersey team as the group away had a few guys that could take yellow if it stuck. with about 60km to go we had brought the group back. Attacks started again and Tipper was all over them as we had worked so hard for him. He managed to get in the move that stuck to the line and he took the win. This topped off a great day for the team and was a great win for him to get. Stage 7 another sprint stage. Team worked well but had bad luck in the final kilometer with Tipper puncturing. Stage 8. Pierre made the break of the day which was caught on the line. He managed to get 5th while Tipper was 4th. A solid team performance again by sticking to the plan from the team meeting. Stage 9 the penultimate stage and another pure sprint stage. Not much happened till the final few kilometers. We were fighting for position in the final 3km for Tipper, with 2km to go the road split and we took the wrong side and it left Tipper exposed too early. He managed to get 7th on the stage. stage 10 only 128km with six 5km finishing laps in Casablanca. The team took up control with 40km to go to bring the break back and keep Tipper out of trouble on the finishing laps. On the final lap it got fairly chaotic in with 2.5km to go as at this point there was a dead turn in the middle of the road. we managed to get Tipper well placed for the final corner and he was able to get 4th to finish off the tour for the team. It was good to finish the race on a high with use working hard and well as a team and then delivering a top 5 at the end of it all. Only one week until the next race Rutland Melton Cicle Classic. So it was two days off the bike including the travel day then back into training. I wasn't able to train fully as I was loaded with cold but managed to keep active and for the cold to nearly fully clear up in time to race. Still not feeling 100% it was time to pin a number on again and get stuck in for the day. The race didn't go to plan for me having three rear wheel changes within 50km of each other. The 3rd change ended my race due to the timing of it and how long it was till the cars could get to me. Tipper and Pierre were still riding strong until bad luck hit both of them taking them out of the peleton. Tipper eventually had to settle with finishing 3rd group and Pierre in the 4th group. Rob stuck in to get the last finisher prize. Not the day we hoped for after such a successful Tour Du Maroc but that's bike racing. After Rutland I took three day off the bike and then two very easy day as a break was needed to get rid of the cold completely. Off the back of the easy week I did a time trial as it was in my village. I managed to be the fastest on the day by 39 seconds even though my power was down due to the time off. Now it's time to start training hard for the next block of racing for the team that will take me up to the nationals. 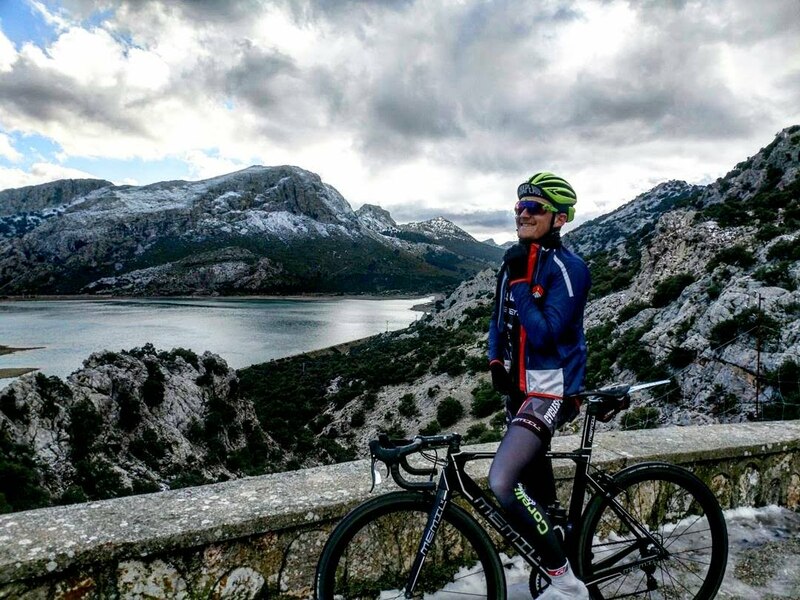 So 2018 training started in Mallorca. I had 4.5 weeks there before coming home for a few days before heading to the Philippines to start the season off. Unfortunately this race got postponed due to the volcano erupting. Which then meant 2 weeks training at home before flying to Taiwan. 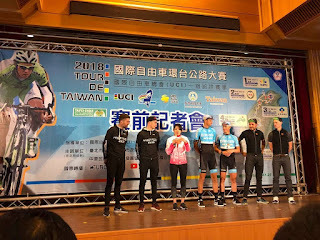 Once in Taiwan the team were there for 2.5 weeks of training and acclimatizing before Tour de Taiwan. The training was going great right up till the race and all my data was improved from 2017. So I was looking forward to racing and putting my training to use. It had felt like so long since my last race in September and I was more the keen to be back racing properly. 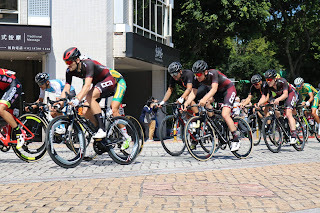 Tour de Taiwan stage 1 was a flat city circuit of 88km passing the Taipei 101 building and Taipei city hall every lap. The stage was very controlled from the start with a break of 3 getting away from the start. The break was eventually caught with 8km to go. The teams goal was to look after our sprinters and let them both got for a result. Roy was able to manage 7th on the stage. 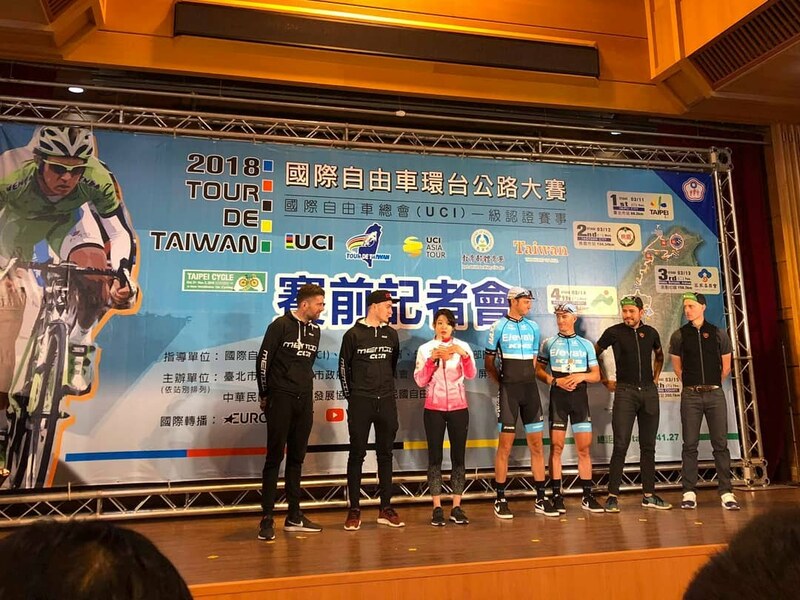 The teams first top 10 of 2018 in a UCI 2.1 race. Stage 2 was 119km finishing at the top of a 1st cat climb with 2, 2nd cat climbs within the last 40km of the stage. The stage was on from the start and we covered over 50km in the first hour. eventually just after an hour the break went with Roy in it, he was able to take the sprint points and move up the points classification. After the first climb the peleton got sent the wrong way by the race, we got put back onto the correct route and carried on racing. I managed to make the front selection over the 2nd climb and thought I was in with the chance of a decent result only for the race to be stop for the earlier confusion of getting sent the wrong way. This meant the whole race was back together with only 18km to go. The break got the time gap they had when the peleton were sent the wrong way. After over 10 minutes of waiting around the race finally resumed and was full gas all the way to the finish. What I thought was going to be a decent result turned into nothing. Riding as a unit from stage one. Stage 3 the goal was to try get Roy closer to the points jersey and maybe even into it if all went well. the stage once again started very fast on rolling roads. As the big teams were trying to let the break go Roy managed to get away and ride across to the break. We kept feeding him information to what was going on and what he should do. He managed to take maximum point and was virtual points jersey on the road and we then told him to take it easy and if he made it over the main climbs before the peleton caught him maybe he would have a chance of the final sprint. Unfortunately he was caught and drop before all the hard climbs were over. He then was taking risks on the descents to try stay in contact with the race. The risks didn't pay off and instead they resulted in him crashing hard on the descent and also crashing out of the race completely. What was looking like an amazing result by the end of the tour for the team was gone. Stage 4 was 168km with a 3rd cat climb in the first 50km and a 1st cat climb topping out only 15km from the finish line. 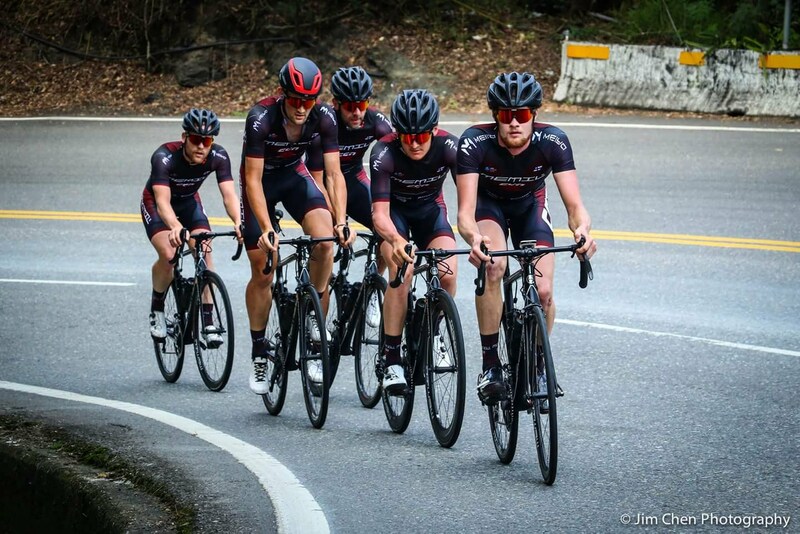 The team plan was to get someone in the break. Sam and I were in a couple of breaks that looked promising but other teams had different plans. The break went just after the first climb and we all missed it. We chilled in the bunch the rest of the stage and tried to do a decent ride on the final climb. I made the second bunch on the road. The final stage was a flat 200km day with a slight cross wind. It was virtually an out and back course with 3 finishing laps of 13km. Another real fast start to the stage with us trying for the break but with the pace close to 60kph it was hard to get away and when away it was full gas to get no where. eventually all the big teams had enough and spread across the road and eased the race up and allowed 5 guys to get away. Our job now was to look after Jacob for the final sprint. I was on bottle duties for the final 100km after riding in the wind at the front of our line before that. Once on the final circuits Rob did a great job of looking after Jacob in the first 20. In the final ks Rob made sure Jacob was always in the top 15. After a great team effort in the stage Jacob managed to finish off the job with an excellent 4th place and the teams best result to date. This result also made what became a bad race after losing Roy a success again. Next up will be Tour du Maroc. A great race which I really enjoy as it's a 10 day race covering nearly 1600km. After a great sprint in the final stage Jacob will be going into this race with the belief he can do well and the team spirits are high ready to keep the ball rolling for more results. I'm also hoping for some results in the race as a previous stage winner. Now I've been home for nearly 2 weeks, I'm ready to get out to Morocco for the race and the warm weather. This rain and cold weather isn't very enjoyable for training. Team training and stage reccy. After a solid block of training in Mallorca it was time to head to Sweden for a weekend of racing. The weekend consisted of a 1 hour crit on the Friday night, 190km UCI 1.2 road race on the Saturday and an open 130km race on the Sunday. The crit was a square with 2 straights that were cobbled. 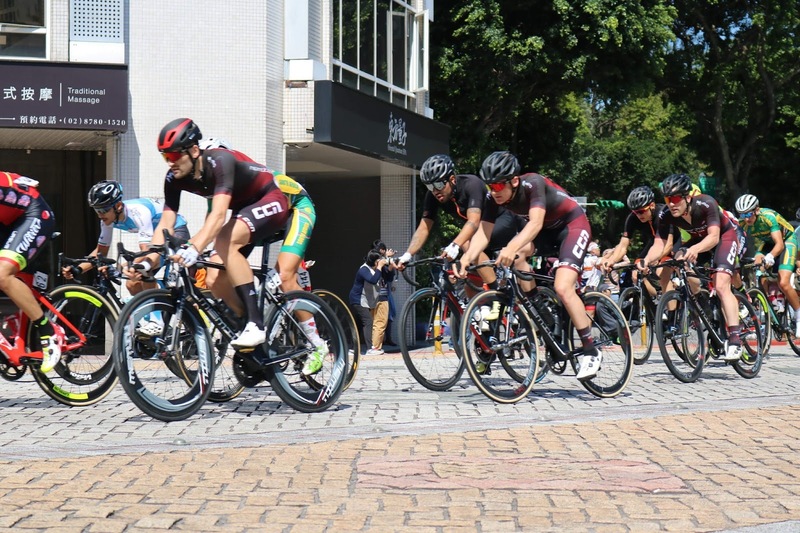 It was fast from the start and didn't let up until the finish with some strong uci continental teams controlling it for a sprint. i managed to stay around 20th all race and tried to attacking with 5 laps to go but was soon brought back by colo quick. In the end finishing near the back of the front group in 22nd. The following day was 11 lap course including the crit circuit, it covered 190km and was pan flat. The team managed to get Pierre in the break of the day. I was fighting to stay near the front most the race and then once the break was nearly back all the counter attacks started. I was following most of them for the team to make sure we had a guy in one if it was to stick but none did. After doing that my legs weren't good enough to make the front split in the final lap. This adds another get round to my tally but not the result I was after. The following day was an open 130km sportive race thing which, Hiski and I rode full gas from the start. Mainly for a good days training. I managed to clock the 2nd fastest time of the day for it. The weekend after saw me head to Astana, Kazakhstan to race in a post Tour De France Criterium. This was a race I was looking forward to doing and some massive names in cycling were racing. The biggest name being Chris Froome. Also we were staying in a Marriott hotel. It was some trip to be going on. The crit was on a flat square course. It was fast from the off with no breaks sticking. I tried 3 times during the race but the pace was that high it was so hard to keep it up once off the front. With 5 laps to go I managed to do a lap solo and get a bit of tv time as the race was live on Eurosport. Then the next race was my Regional championship weekend. Not a great weekend real. In the crit I managed 3rd after being worked over by the local elite team. Then on the Sunday it was time to try defend my 2 time Regional championship title. I was marked out the race from the start with everyone following me or looking at me to pull riders back. Unfortunately the course wasn't hard enough to ride away from the others. It turned into a very frustrating race and one to forget. With no racing until China I had 2 weeks of training to do. The first week had more volume then the second week was harder efforts leading into a the days before flight where I was taking it easier. After just over a week off the bike recovering from what had been the hardest first half of a season I've had to date, I headed to Mallorca for a 3 week training block before starting the final part of the season. Feeling fully recovered after the time off the bike I aimed to do a big block of training like I would do in the winter. Averaging just under 30 hours a week, the only difference to winter training was I was doing a lot more intensity during these weeks. 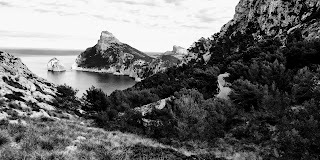 Sa Calobra used at least twice a week. The first week was hard due to the massive temperature change, by the end of the week I was able to hit close to the numbers I was aiming for. By the second week I was fully use to the heat and wasn't suffering in the efforts due to the heat. Then the third and final week I was hitting the numbers I wanted for each effort fairly comfortably and consistently. Also the final week Peter came out so we went motor pacing one day which was good day, keeping the pace on all day. Riding up the climbs full gas and making me get every last bit of power out up them. This showed with getting the KOM up Coll de Femenia, putting 10 watts onto my previous best up the climb. All in all as great training period with over 86 hours of riding, 2440km covered and 30,000m of climbing. 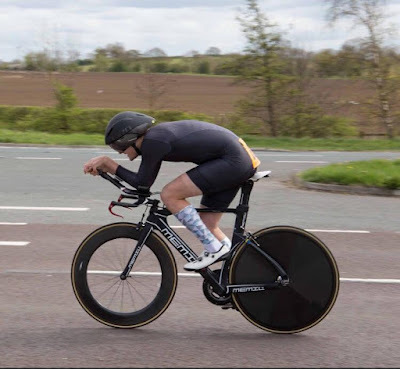 The day after I got back I did my local time trial to see how I was going, I managed to PB by 6 seconds which also meant I took the course record as well. This was a nice boost for the morale to see that the hard work was paying off. Then I had 2 days easy to recover before doing a race in scotland as a bit of hard training. I tried numerous time to get away and failed. 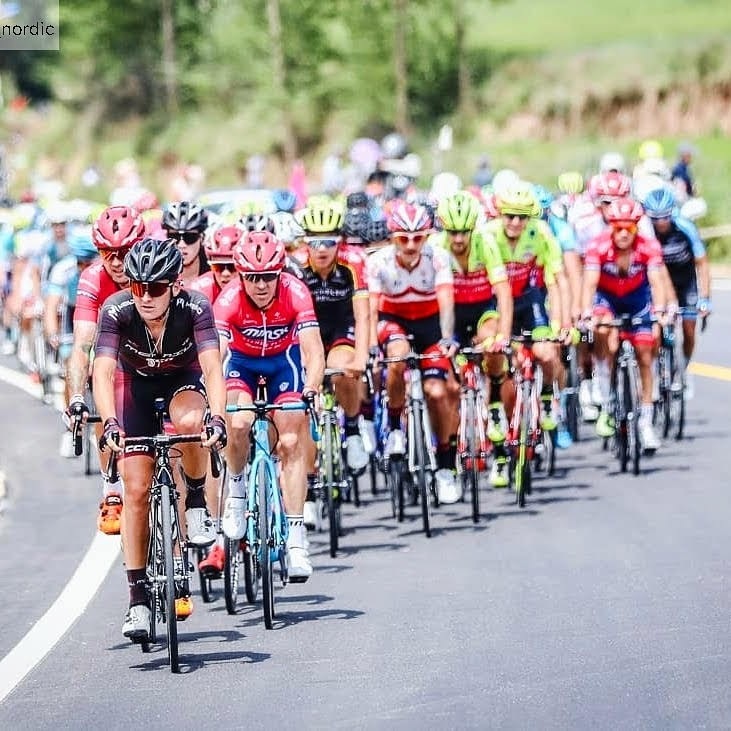 Once I knew I couldn't get a decent result I just started riding hard on the front of the bunch to make it a hard day for myself and others in the race. This race was the first day of my last 4 day block before flying to Sweden. Now only 2 more days hard training before the last part of the season with the team. Last months blog was a bit rushed and missed out the most important part which was to say a massive thank you to Ian and Annette Kelly for being kind enough to let me stay in their home for the week of national. After a good block of training in Sweden, I headed to Estonia with the team for a two day UCI 2.1 race. Stage 1 was a 220km long stage, I was following moves for the team at the start and then made the second group when it split on the 5km gravel section. Unfortunately this group was caught and I was drop as I had no legs left after 180km. Stage 2 was a 17 laps of a very technical 10km circuit. unfortunatly I didnt have the legs and was dropped and didnt finish the final stage. After coming home from Estonia I had 3 weeks to get use to my TT bike for nationals. 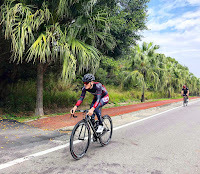 I did my first 10 mile (16km) TT and it didnt go well my power was well down on what it should be. I had only 3 weeks to try find some good numbers. With days until the national tt, I went to Wattshop for some aero testing to try gain some free speed as my power was well down still. I made some great savings taking my Cda from 0.215 to 0.183. The nationals were at the Isle of Man, the time trial was on a hilly 22km course. When riding it the day before I was expecting to do 30 to 31 minutes for the race. On the day I managed to do 29.37 which was good enough for 5th u23. I was really not expecting to get a top 5 with my form as it was. Come the road race my form really showed and I was pulled with 70km still to race. I was pleased with my unexpected 5th in the tt in the form I was in. Obviously my pre season goal was to do a lot better. Now I will have a week of to recover from the first half of the season, before I head to Mallorca for 3 weeks training to prepare for the last half of the season. Hopefully get some good form back to get some results for myself and the team. Rest and then Sweden bound! After a solid start to the season with a great block of training in Spain then racing in Rhodes, Taiwan and Morocco it was time for a mini break and have some time to chill out. 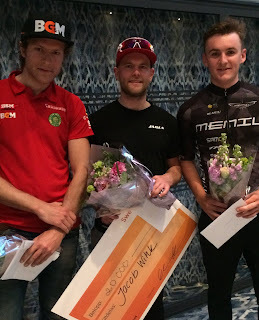 I had 2 weeks at home before I left for Sweden so I just did what I wanted and rode my bike for enjoyment, I mainly rode to cafes with my mates and I did the odd local race for fun. I spent this time at home catching up with friends and family. 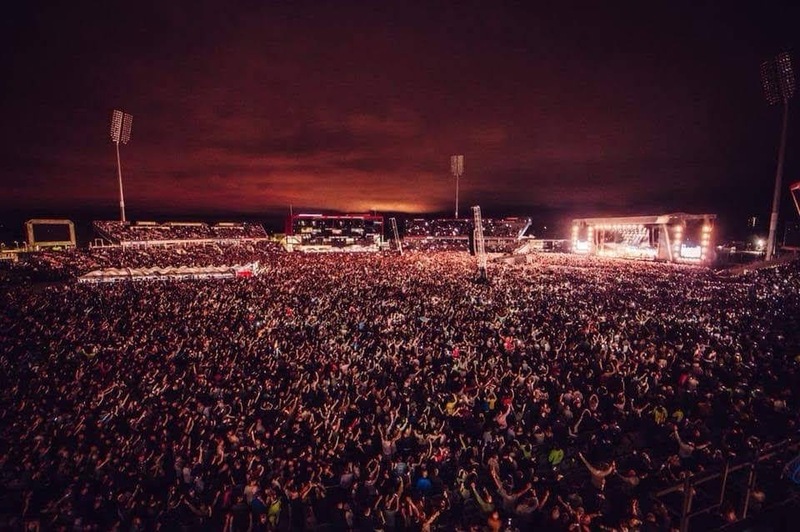 I had a day/night out in Newcastle with mates to take my mind of cycling and just relax and enjoy myself, before going to Sweden to start racing and training again and get in shape for the National Championships in June. lap was very technical with 12 corners in 1.1km's. I wasn't expecting a result here as these things aren't my favorite types of race. I was hanging on in around 20th position waiting for the pace to drop as it normally does in these races you just need to make it past 30 minutes. It eased right up after 40 minutes for a moment and at this point I attacked the was 1 rider away as he got clear a lap earlier for the sprint lap. I caught him and another rider caught us. With the laps been so technical it was hard to work together and the 3 of us split into ones due to our cornering abilities. I wasn't able to hold on to them and ended up been the third rider, luckily I was able to stay away from the bunch thanks to the help of my team mates behind and crossed the line in third place a result for me and the team that we didn't expect just over an hour before. The following morning we were doing a 140km road race around the local area of Gothenburg. The teams plan was to win this race. So we set out to do this, we only had a 3 man team here and other teams had 6-10 riders. We worked great as a team and had full control over the race from the start. Getting in every move and really animating the race. After 60km I got away solo in a cross head wind section. I stayed away until 105km at this point my team mates had been covering other moves and a group of 8 caught me with the peleton just behind. Both my team mates were in this group, we worked hard to try take this group away from the peleton but it came back together. As it came back together Yannick attacked and formed a 6 man break with my other team mate Pierre in it. Once the break got a gap Yannick attacked again and went solo all the way to the finish. For some time Pierre was in the gap riding for second but was caught by the bunch in the final few kilometers. He managed to stay with the bunch and sprint in for 6th. We did what we planned to do and took the win in the race. A great first weekend in Sweden with 2 podiums in 2 days. Now it was time drive down to Bastad where the team own a house for us to stay in. This would be my home for the next 3 weeks. It has both flat and hilly roads to train on which is perfect. I was mainly on my own as Yannick had business to do else where. I had one week of decent training before a trip to Uppsala for the UCI 1.2 Scandinavian race in Uppsala. This was on a technical 12km lap and covered 15 laps. The team got one rider in the early break which got caught in the final lap. I was on a very bad day and wasn't able to offer much help at all for the team which is very disappointing for me and the team. It was a big day of learning for me though, the race was of a high level and raced different to any race I have done before. Even though I was terrible on the day I feel I have came away from the race better off due to the experience gained. Time to head back to Bastad for 2 weeks solid training before going to Estonia for The Tour of Estonia UCI 2.1. With Yannick having to go home for the next week and a half I had to drive the team car back. This drive was straight after the race and covered over 600km, adding to that it was my first ever time driving a left hand drive car. Talk about getting thrown in at the deep end. The drive went fine and I eventually got to bed just after 2:45 am. I had the day after the drive as a rest day due to such a long day the day before. After the rest day I planned for a training block of 4 days on 1 off 4 on then easy days until Estonia. The first 4 day block went to plan fine and did the training I planned and hit the numbers I wanted. After a rest day I started my next block, I did the first 2 days fine but on the 3rd day I woke up absolutely shattered so instead of pushing myself to the plan I listened to the body and had and easier day and hoped it was a 1 day thing and not me coming down with something. Now my training is over and hopefully soaking in well. Tomorrow I will be heading to Estonia for the Tour of Estonia UCI 2.1 race what starts on Friday. Which give me more than enough time to recover from the block of training and be feeling good for the racing to come at the weekend.